South Africa! Malawi! Italy! Spain! All cycling destinations for keen two-wheeled teams, as they pedalled far and wide to share the love of Christ—and they prayed fervently for God’s leading, as they passed through new landscapes, some without a known church. The ride began at Transform, OM’s summer missions and outreach conference in Europe, then spread far and wide. This is the cyclists’ story, shared by Michel, Chris and Gert. Chris had first heard of this ride when a couple of leaders cycled to Rome, Italy, for the Transform conference. By then, he already had some experience with a similar cycling trip; in 2012, partnering with another organisation in South Africa, his team cycled from Johannesburg to Cape Town on a ‘road less travelled’, passing through a lot of small villages. In 2014, they reversed the trip, starting in Cape Town, ending in Johannesburg, this time adding outreaches and training at specific ministry points. By 2015, Chris was ready for a new challenge. He decided to bring a cycling team across the border into Malawi, a country where everyone cycles, and bicycles are used to transport literally any and everything. Although the main focus was prayer, the team was able to also hand out audio Bibles and facilitate training in sports and orality. “We were nine people on bikes, and amazingly, felt that God had handpicked each one,” recalls Chris. “We saw much fruit coming from this Malawi tour, also from within our own hearts. It has helped me to focus my prayers.” Later Malawi teams have also stopped to pray in Mangochi along the former slave road. Gert Daling (Netherlands) did his first Ride2Transform in Malawi in 2016, with a team of 17 people, and the following two years, he co-led the same outreach. The areas through which the teams cycled are, for the most part, considered least reached, meaning people living there have had little to no opportunity to hear the gospel. Ministry teams were often placed in different locations along the way to train the local people, and the cyclists distributed audio Bibles in the local language. Another year, a team member went into several mosques, giving audio Bibles to imams, and they also handed out audio Bibles to people of influence in the community. “We went to a school right next to a mosque, and before we knew it, we were standing in front of all these kids sharing our story and sharing about Jesus,” says Gert. A highlight for the team in Spain was the very first night’s accommodation. They stayed at a rehabilitation centre run by a Christian group. In the evening they worshiped together and shared their testimonies. Roger Ballester (Spain), who was driving the support vehicle, was specially moved by this fellowship; many times as he prayed he found his eyes filling up with tears. Along the way, the team visited churches, enjoyed fellowship over a meal and gave a presentation about OM. The second year, fundraising for Syrian refugees was included. 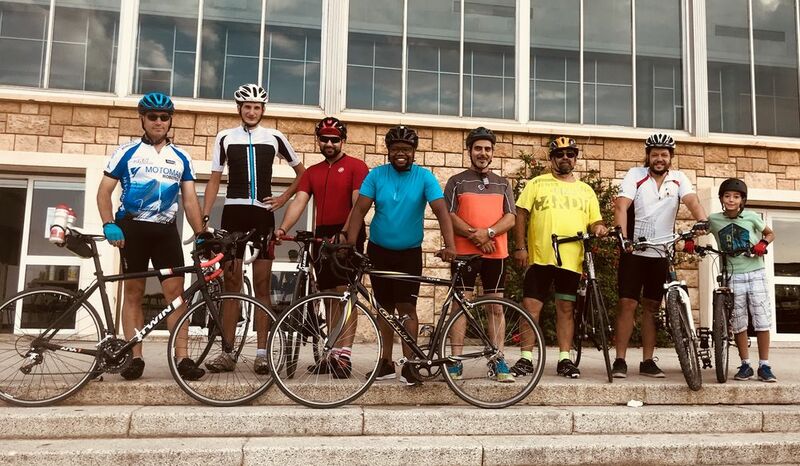 “For me, it was a great way to connect with local churches, share about ministry, get to know my fellow riders, test my limits and, through that experience, I also got to know the church I now pastor!” summarises Michel, smiling. All three outreaches are still being done annually; Ride2Transform Malawi and Ride2Transform Europe are organised by OM. Please contact your OM home office if you’d like to join. *OM SportsLink International serves to equip, empower and mobilise local OM teams and partners to be effective in ministering in and through sports, in order that athletes and coaches, local churches and communities can make the most of sports within their culture through sharing the gospel in relational and relevant ways.